1) Border bridge over the Rhine near Balzers, Liechtenstein. Picture looking into Switzerland from Liechtenstein. 2) Rhine River from bridge. CH on right, FL on left. 1) Close up of bridge markings. 2) Footbridge across the Rhine. This bridge is visible in picture 2 above, south of the Balzers bridge. This shot is looking into Switzerland. 4) Close up of the border on the footbridge. 1) This is the covered bridge just west of Vaduz. This shot is looking across into Liechtenstein from Switzerland. 2) Inside the bridge this is how the border is marked. 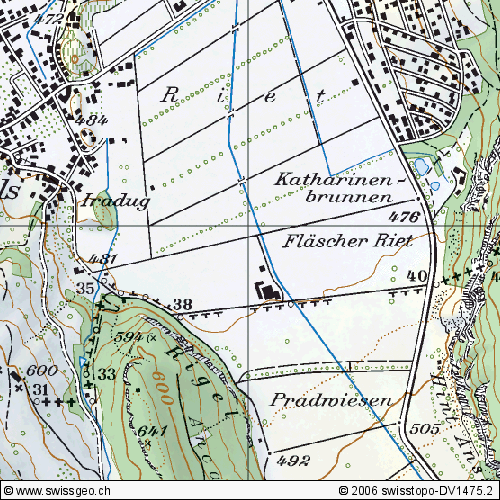 1) This 1:25,000 topo map shows the southwesternmost corner of Liechtenstein. It's an interesting border jaunt. The pictures that follow are from this part of the border. 2) This is the end of the paved road/trail at the extreme end/corner of the border. The pavement ends where the garbage can is, but the borderline itself crosses the path a little further south on the dirt track. On the tree in the upper middle part of the picture a yellow blotch is noticeable, which denotes that the border marker (#2) is nearby. 3) Marker #2. On the Austria border the markers say FL. 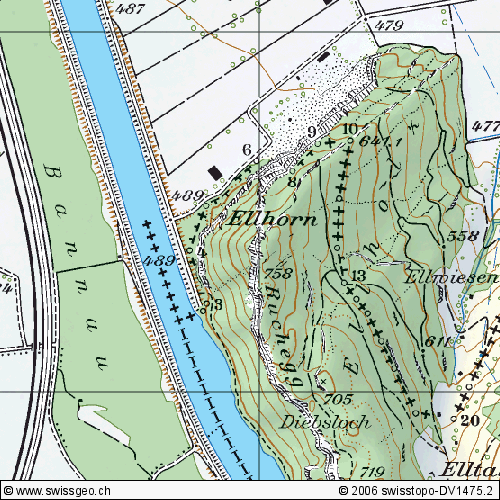 On the Swiss border, though, they say L. I couldn't see a marker #1, and one is not notable on the topographic map. 4) The Swiss side of marker #2. 1) Top of marker #2 showing the corner noted on the topo map. The left line goes straight down to the Rhine. 2) Nearby is marker #3, where the border makes another turn. 1) Marker 5, adjacent to the road. 1) This topo map shows the border crossing the road at marker 35 then following the east side of the road south to a small road, which it crosses and then parallels to the main crossing point. 2) This is the place near where the border crosses the road, but I don't believe the pavement change is on the border. I think the actual border is behind me about 10 meters or so. In any case, at this point the border runs along the left side of this road, looking south. 3) This is border marker #36 just to the side of the road. There is a slight turn, according to this marker and also according to the topographic map. 4) This is border marker #37 just to the side of the road. This shot is taken looking east. It and the topo map also show a slight curve in the border. 1) At this point the border cuts across this small road to the marker on the right (#38). 2) The red sign is a Swiss cycling association sign that shows this as a good cycling path (I agree). The sign is Swiss and just inside Switzerland, but the entire trail (the road) is in Liechtenstein. 1) Further down the road shown in number 1 above, is marker 39. This shot looks east. 2) Close view of marker 39. 3) At the end of the road, where it intersects with the main highway, the border crosses the main road to read marker #40. This shot is looking west. The pavement changes noticeably to the right of the actual border. 4) The border crossing looking south into Switzerland. 1) Marker 40 (left) and old marker with FL flag and welcome sign.